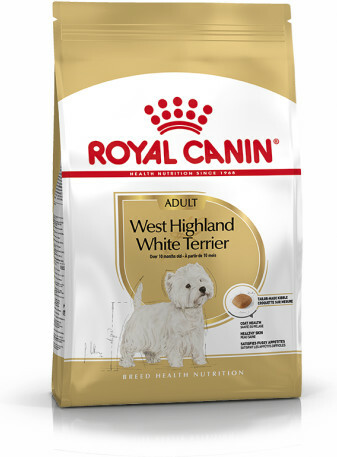 West Highland White Terrier Adult Royal Canin West Highland White Terrier Adult dry dog food, from 10 months old. Coat health Compared to other dog breeds, the WEST HIGHLAND WHITE TERRIER has a rough coat and delicate skin. This formula contains specific amino acids for hair growth and fatty acids from borage oil and flax seeds for skin health. Healthy skin This formula helps support the skin’s "barrier" role (exclusive complex) and maintain skin health (EPA & DHA). Maize flour, dehydrated poultry protein, rice, maize, animal fats, hydrolysed animal proteins, dehydrated pork protein*, wheat, chicory pulp, soya oil, fish oil, minerals, flax seeds (0.5%), fructo-oligo-saccharides, borage oil (0.1%), marigold extract (source of lutein), hydrolysed crustaceans (source of glucosamine), hydrolysed cartilage (source of chondroitin). *L.I.P. : protein selected for its very high digestibility. Crude ash: 6%. Crude fibre: 1.4%. Crude oil fats: 16%. Moisture: 0%. Protein: 21%.